I once mentioned to my English mother that I wanted to visit castles. She replied, “Go to Scotland. It has more castles than any other country.” Indeed, I have visited Scotland twice, hunting for castles. The crumbling castles ignite my imagination. Lady Tara Davidson, the pampered heroine in Cathy Maxwell’s THE BRIDE SAYS MAYBE, does not share my perspective. When she marries Laird Breccan Campbell, “Beast of Aberfeldy”, she accompanies him to his home, Wolfstone Castle, “at the shadow of Schiehallion, the mountain that was also known as The Constant Storm.” As Tara would soon learn, Wolfstone Castle did not offer the comforts of the Regency Era. Tara’s adventures in the castle, and her interactions with Breccan’s clansmen, are a highlight of THE BRIDE SAYS MAYBE. - Castle Campbell, nicknamed Castle Gloom, was the seat of the chief of Clan Campbell until 1654. - Inverary Castle in Argyll is the current seat of the Chief of Clan Campbell. My family visited Castle Campbell during our first trip to Scotland. The imposing ruin sparked my imagination as I heard whispers of glory from a time past. Cathy’s books continue to feed my imagination of Scotland. I invite you to join Tara, Breccan, and the Clan Campbell in THE BRIDE SAYS MAYBE. Churches & historic buildings always make me think of days gone by and those who came before. The history surrounds you & speaks to you. Inspired? Most certainly. Mary, I've been in many churches in Europe that gave me that feeling. I got to visit The Sydney Opera House a few years back and oh was it magical. It looks so imposing on TV and in pictures but seeing it in front of me made me stand in awe of it's magnificence. And to think of all the events that have gone on inside. It's wonderful. I don't know if my first comment will post so just in case I'll submit another. Historical churches near my home give me a sense of times past whenever I enter and just close my eyes. 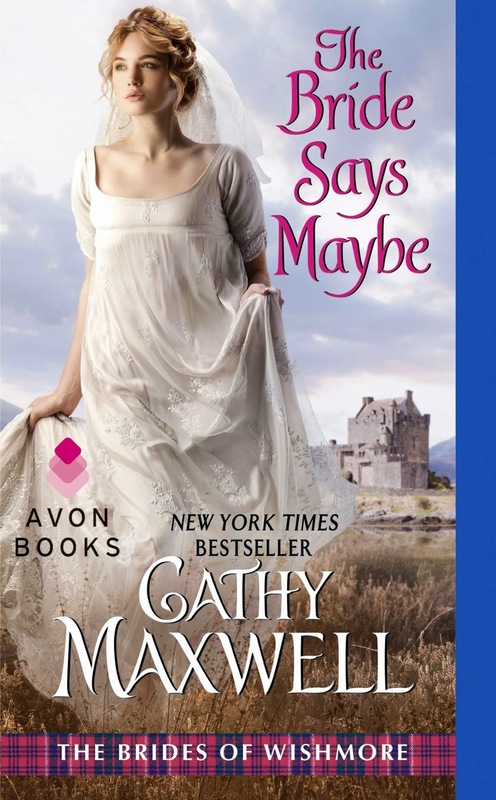 Love Cathy Maxwell's books and look forward to reading The Bride Says Maybe. Hope you enjoy the book, Carol. I loved it! When I visit museums and see the everyday items that people used hundreds of years ago it always has me imagining what their lives were like. Imaginations are a wonderful thing, aren't they? Kudos to museums for bringing these items to the general public. 1) Hyatt Gardenaire Inn in Milwaukee- Beautiful renovated hotel with marble staircases and walls and elevators, glass ceiling! GORGEOUS! 3) Rahr West Museum and Joseph Vilas Jr's House Beautiful Home! Many years ago, I visited the Culloden battleground in Scotland. It all looked so peaceful, and I had a really hard time imagining all the killings that had happened there. Thank you for the chance to win Cathy's book. I lap anything up that she writes. Diane, I've felt the same way about some of the American Civil War battlegrounds. Arlington House in VA. Best view ever! It's an amazing view and so much history! I love wandering through Arlington House and around the grounds. I love alpha male male falling for pampered female story's, I'll have to put this one on my TBR list. It's a good series, Julie! We actually meet Tara, the heroine, in the first book in the series, THE BRIDE SAYS NO. She's the younger sister of the heroine in that book and plays a pivotal role in the story. There are a lot of the old southern houses around here from the Civil War times and I would love to go through them. There is also an old shaker village but I have never had the chance to visit it. I would love to read this book, looks awesome. Quilt Lady, I'd love the chance to explore some of those old Civil War homes too. When I was a child - before interstates - we took several driving trips from Michigan to Florida. I remember passing beautiful old Civil War homes and creating stories about the people who once lived there in my mind. I know what you mean. Once, on a walking tour of Siena, Italy, I turned a corner in the old city and fully expected to see medieval knights striding toward me. Edinburgh Castle--A beautiful and imposing fortress, rich in historical stories. Literally steps away from a murder site (rival clansmen, of course) you can visit the chapel where St. Margaret worshipped or the birthplace of King James VI. Mary King's Close--This underground area is an unearthed group of narrow streets and tenement houses dating back to 17th century Edinburgh. It is an eerie and educational experience to tour here. Rosslyn Chapel--How remarkable to visit this place of worship built in the 15th century and still used today. Though religious artifacts were stripped during the Reformation (16th century) and the building was further damaged when Oliver Cromwell stabled his horses there (17th century), intricate carvings abound, filling the chapel with beauty and history. Although I've visited historically-important buildings, not one has been a castle. We don't have very many castles in the US. When I was in high school I got to go to Israel as an exchange student. It's hard not to be inspired by or feel the depth of that country's past! Thanks for sharing! Firstly, I would love to read Tara's story. I fell in love with her when reading her sister Aileen's story recently, and I look forward to continuing the story. When we travel, places of historic import are always on our agenda. The first place that comes to mind, is Fort Ticonderoga in northern New York State. It figured prominently in the French and Indian War, the Revolutionary War, and the War of 1812. We have visited many times over the years. The most memorable have been times when they have had evening events. The first was a concert by a pipe and drum band from Canada over 35 years ago. It was a still, starry night with the parade grounds lit only by torchlight. The music echoed as the band marched up the road, through the tunnel, into the parade grounds. With the smell of leather and sound from the bagpipes and the drums, it really felt like we had stepped back over 200 years in time. Back at our campsite that night, we could hear pipes playing at other campsites around us in the woods. Another event there was a French and Indian War reenactment. We were there at night and the British, indian, and French campsites were lit only by fires and candles. The tents have a lovely golden glow in that type of light. They had a cannon volley demonstration, firing 6 cannons in different patterns. Very impressive, and loud. We also walked out into a field, by lantern light, to watch an encounter between a sentry and approaching enemy troops. There was no moon, and it was overcast. We couldn't see the re-enacters not 100 feet away. How on earth did the sentries ever see anyone approaching. There were challenges and shouts, and the flashes of musket fire. If anyone was hit, it was pure luck. We have visited many forts and living history sites, but none ever gave us the feeling of really stepping back in time. One of these days, I hope to get the chance to visit the Highlands and see of the castles there will give me the same feel of another time. I have to say I haven't actually been anywhere that inspired me but I would love to go visit Castles in the Scottish highlands. I love reading about them and it would be incredible to actual see one for reals. I'm a house cat so I don't travel much thats why I love to historical books they take you to some wonderful places to visit without leaving your home.